Fast technique and excellent handling characteristics allow for quick and easy placement. 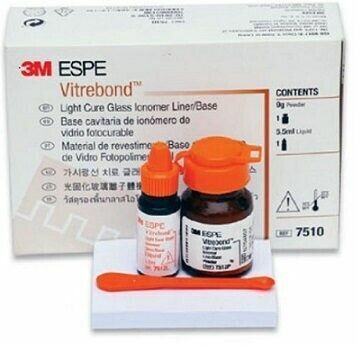 Forms a strong bond to dentin, sealing the tooth to reduce the incidence of microleakage which helps reduce post-operative sensitivity. Intro Kit, 9 gm. Liner/Base Powder, 5.5 ml. Base/Liquid, Mixing Spoon & Pads.